I have known John Betts for a lot of years now and have developed a huge amount of respect for the man, but just when you think you know the last corner of his character, he comes out and does something completely different, like this book. 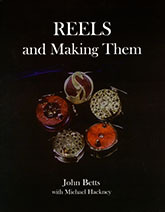 At the very time when most people would be relaxing and enjoying the fruits of a long life, John has gone out and published 450 pages on how to make reels without using complex machine tools. Yep, you did read that correctly; this is a book about how to make reels by hand all the way from fabricating the screws right up to handling the aluminium, brass and wood required to make the frames and spools. The text is a reproduction of John’s shop notes, wrapped around 450 colour photographs, dropped into the middle of which is a section on how to make Aerials, which lifts this work into a class of its own. John being John, you also get stories of how he met Ari ‘t Hart at a New York fly tying show opposite an overflowing men’s toilet room, which is what got John started making reels; and some fishing thrown in for good measure. So this is not a standard manual, although it is hard to imagine a better set of instructions to get a beginner started out making reels, but I ought to add a word of warning, which is that John’s notes are hand written in pencil - in other words, this book isn’t typeset. My own view is that this only adds to the charm of the package, but it does make it a little hard to read at times, especially if the light isn’t optimal in your workshop. I reviewed the limited edition, every single copy of which has an original plate drawn by the author, who on top of all his other talents, is an exceptional artist, but this has sold out and the ordinary edition should beavailable shortly. If you are thinking of whiling away the winter nights doing something completely different, this would make a great place to start. The best news of all is that if you can’t wait for the book to cross the Atlantic, you can download the sections for free here but my suggestion is that if you are inspired to build a reel of your own, the least you can do is buy a copy of the printed edition.